Join the discussion on our forums! Come discuss Phantom Freebooter over in our dedicated Phantom Freebooter discussion topic. Always wanted this card to become good. Shame, it's a bad pull even from Captain Hooktusk. 6 mana 4/5 with a 1/2 weapon. Might be great with Fiery War Axe, Arcanite Reaper etc but as a clear body, terrible. Can be good in weapon heavy decks. But dies to Golakka Crawler. I hope it won't be stronger than whatever pirate warrior has already. Nice looking Pirate. People will play it. Whether it's better than Kor'kron Elite, Mortal Strike, Dread Corsair, Naga Corsair, or Spellbreaker is yet to be determined. There's a lot of possible 4 drops in Pirate Warrior already. Play this with Doomhammer and it's a 4 Mana 5/11. Not very viable a combo, but it's fun to dream. ARG! This is more likely to see play in standard pirates, but could become a main-stay one-of in wild mode. If you play it after Sword of Justice, will it be 5/9 or 5/8? This card is kind of a toss up, if you wait for an overstated weapon you could take too long and still lose the card to removal. It might be pretty powerful, but I don;t think it'll be OP. 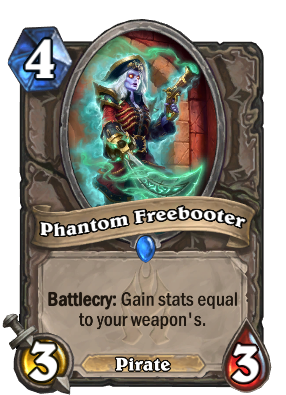 I don't see this being put into aggro pirate honestly even though it is a Pirate as well. The effect, however, could make it a decent 4 drop in midrange and control decks. I think Paladin will get the best use out of it since the weapons they typically use can give it the most even into the later part of the game. Though keep in mind that the 4 slot is a bit crowded with Paladin just as well. This will be so broken at 4mana. It could possible just take one of your hard removals.